Early Sunday morning, the driver of a red two-door convertible got into a fight with a pedestrian in Daytona Beach, Fla. That unidentified driver started to take off rather than continue fighting. But according to Daytona Beach Police, and witnesses at the scene, he didn't. They say the driver started to leave but then turned around his car and struck the victim, killing him, then drove off. The Headline Surfer offered some more details about the altercation. A small red convertible car and a black Range Rover were at the light at Seabreeze and Oleander early Sunday heading westbound when words were exchanged between the driver of the red car and two pedestrians. The driver of the red car got out and a fight broke out. The driver of the Range Rover then got out of his vehicle and reportedly told his friend, "Let('s) go, it's not worth it," according to the press release. Both drivers got back in their vehicles and continued westbound on Seabreeze while the men walking continued south on Oleander and to the rear of 444 Seabreeze, a parking lot. That's when the driver of the red car spotted them and as they ran in opposite directions, prompting the driver to run over the man who was killed, first knocking the victim into the air with the front of his car. 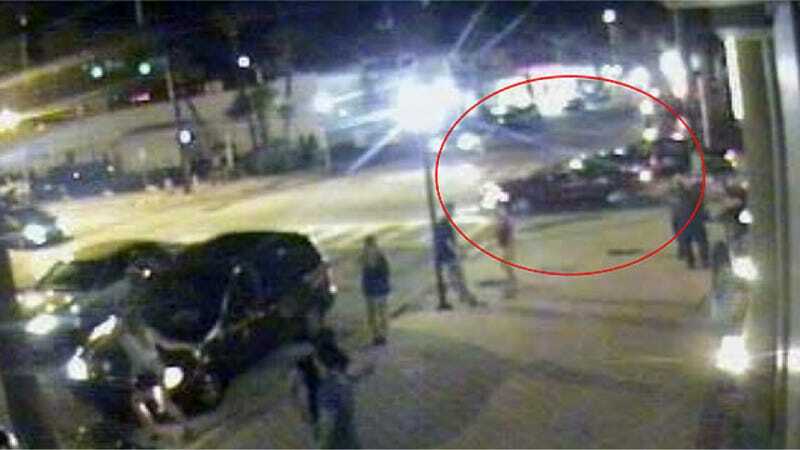 The red convertible then sped off. The victim was pronounced dead at the scene. As of Wednesday morning, police had not publicly identified the driver or vehicle make. That's why they released surveillance pictures from the scene. So, what type of convertible are you thinking?